Kate Chopin wrote several works of fiction in the 1890s and was a native of St. Louis. Her fiction is filled with themes about women discovering themselves in new ways, searching for their identity and revolting against gender conformity and social norms that limit women’s potential. She published 2 novels and about 100 short stories in the 1890s, when she was in her 40s. Her short stories were published in popular magazines like Vogue, the Atlantic Monthly, Harper’s Young People, Youth’s Companion, and the Century. She was well accepted by magazine readers by the end of the 1890s. One of her novels was highly controversial and condemned by critics and fellow writers at the time: The Awakening. The Awakening is the story of Edna Pontellier, frustrated wife and mother. She embarks on a journey of self-discovery, moves out of her husband’s house, supports herself as a painter and surrounds herself with independant women. She even indulges in a romantic relationship with a man (not her husband). The changes in her life free her and fulfill her emotionally and sexually, while also causing great conflict with society’s morals and expectations of proper behavior for a woman. She faces social disapproval, isolation and personal misery if she continues her chosen lifestyle. The novel concludes with Edna’s choice of how to reconcile her identity as a woman with society’s constraints. Critics were brutal to Chopin for showing a wife and mother making choices which violated the strict moral codes of the 1890s. Chopin’s close friends and supporters, however, were more appreciative of her novel and saw it as a work of art that forced the reader into thinking broadly about women’s role in society. There was a revival of interest in her work in the 1950s, and by the feminist movement in the 1970s, Chopin was known internationally as a feminist author. She was born Catherine O’Flaherty in St. Louis in February of 1850. She had a fair amount of trauma in her early years, her father died when she was 5 and she spent the Civil War years in St. Louis, a divided town. She was greatly influenced by females in her life: her mother, grandmother and great-grandmother. Maybe it was her observations of these women and the birth of her own 5 children that made her sympathize with women who choose to seek their own identity. 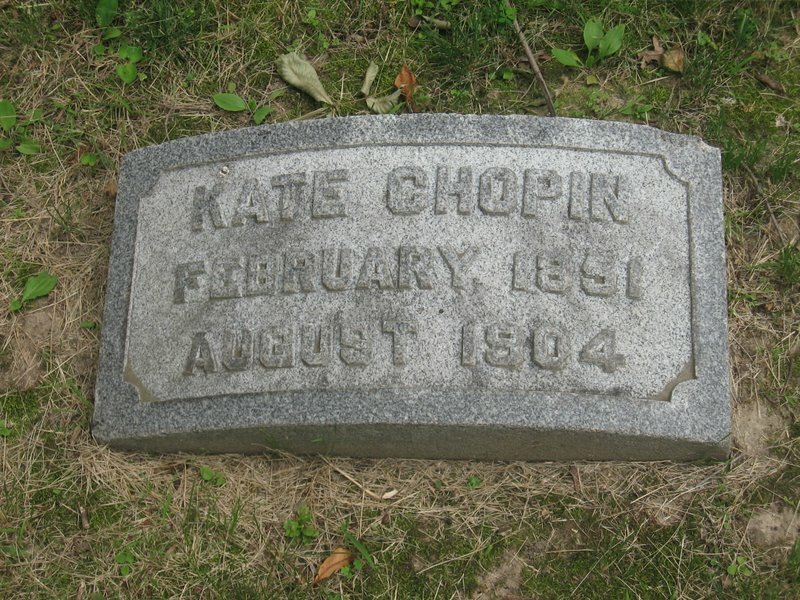 Kate Chopin had deep ties to St. Louis and lived much of her life in the city. She also spent time in Louisiana. The Oakland House in Affton is the home where Chopin met her husband, Oscar. Today it is a restored historic house. Chopin also has a spot on the St. Louis Walk of Fame. She lived at 3317 Morgan Street and 4232 McPherson Avenue in St. Louis. She lived 53 years and is buried in Calvary Cemetery in lot 0047.